Posted November 6th, 2015 by Mobile Music School & filed under Music Lessons, Violin Lessons. Violin tutor, Rebecca Murphy, is delighted to be back again this year teaching our ‘Violin in the Classroom’ programme in Marist Primary School, Crumlin. 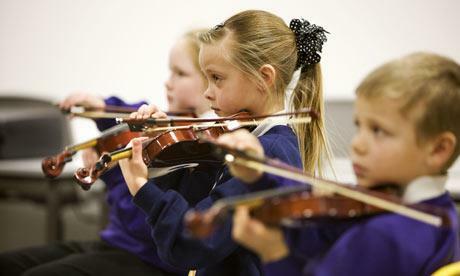 Our senior infants classes are doing pre-instrumental music lessons before progressing onto the violin. They are having lots of fun singing songs, moving to music such as “The Syncopated Clock” and “William Tells Overture”, as well as playing fun and educational rhythm games. Second and third class are doing great, placing their fingers on strings and creating lots of new notes! Fourth and fifth class have been busy working hard on some Spooky Halloween music called Goblins!